Ed & Claire purchased 62 acres of property in the spring of 1961, after several weekend trips to look at homes in the area. 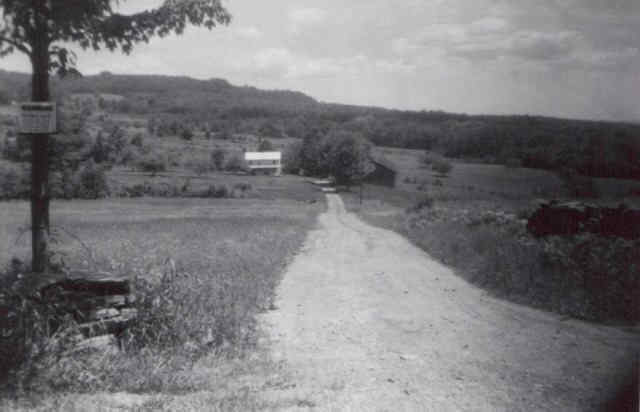 It is located in a valley at the top of Lackawack Hill Road, in the Catkill Mountains of New York State. 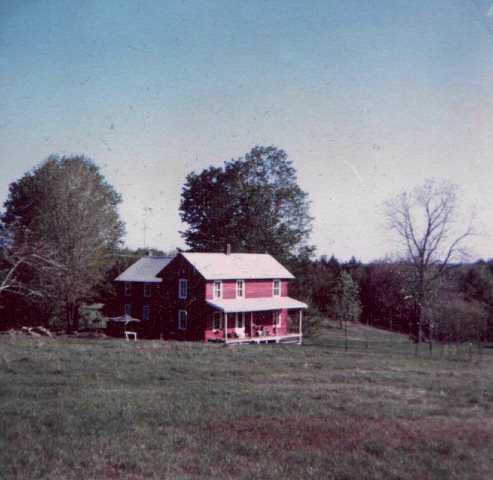 A large, gray farmhouse stood near the center of the square parcel. Outbuildings included two barns, a milkhouse, and a chicken coop. 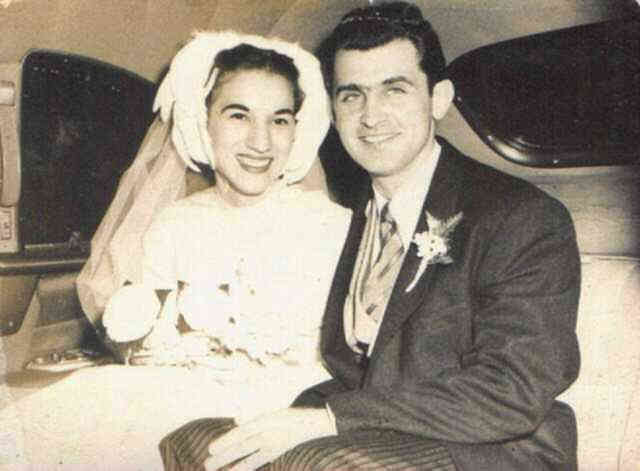 From the early days...(left) Ed & Claire on their wedding day --- 6 years before the farm. 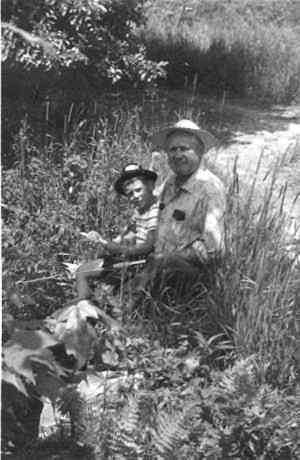 : (right) a photo of Grandpa Christensen with Chris Zona--fishing in the stream in 1961. 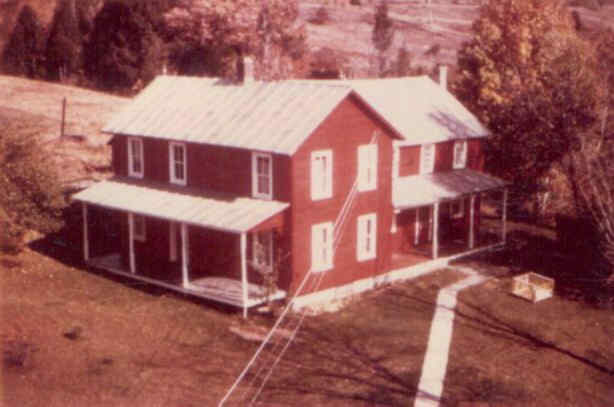 Within a year, the house was painted the classic red with white trim. The metal roof remained silver. Today, a modern log home (complete with wood-burning stove) has replaced the old farmhouse, but we'll get to that later... The barn is undergoing renovation and two ponds highlight the landscape, which remains equally divided between fields and forest. 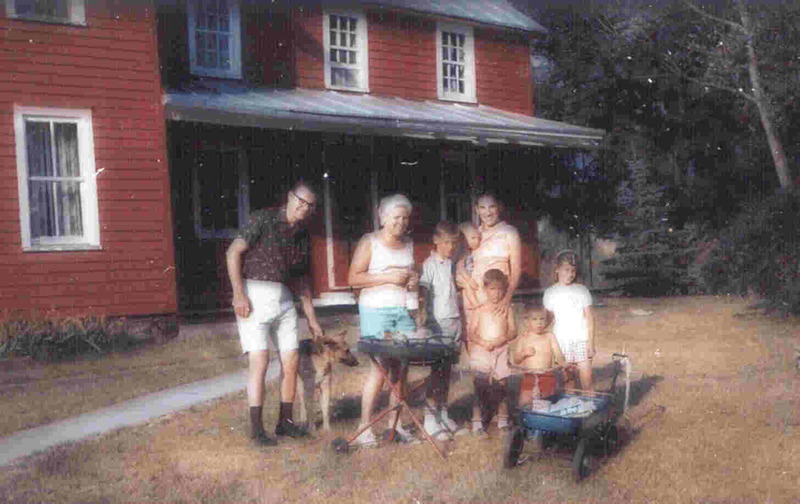 The Farm has played an integral role in the lives of our family. When Ed & Claire first set foot on the parcel, it was a long way from civilization. It was also a trip through history. 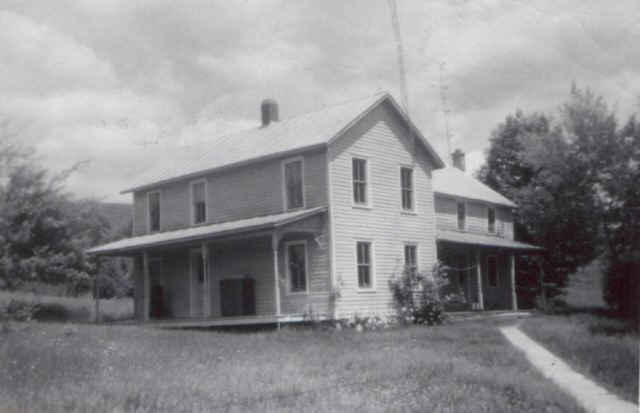 The old gray farmhouse at the center of the property had 2 sections. At that time, the original part was nearly 180 years old, with the 'newer' addition going on 100. Within a couple years, it was painted the classic red with white trim which will live forever in our memories. Ray was born in November of 1961. Steven came along on mom's birthday in December '63. Kenneth made his appearance in October '65. Lorraine finally came on the scene in February of 1969. 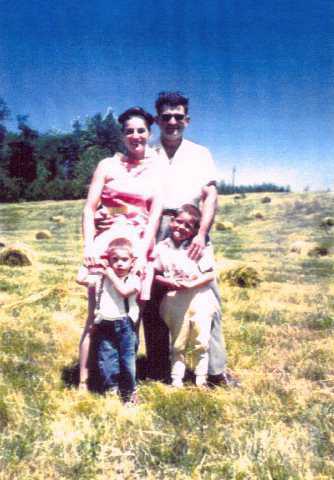 As we continue down memory lane, Uncle Pete and Aunt Kay bring Chris & Barbara Zona for a visit around 1967. A proud mommy and her 3 sons round out the group. At that time, we still lived in the "old side of the house". Czarina (German Shepard) makes a guest appearance. Also note blue wagon, which saw plenty of adventures. The metal roof provided a noisy soundtrack whenever it rained. The old 'summer' kitchen was soon torn down and replaced by a stone patio. A nearby chicken coop and a barn down by the stream were also removed. The large main barn would remain in largely its original condition for the next 30 years, except for roof work. One modification was made in the late 70s with a 2nd floor being added on the east side to provide more storage space.